I hope you are all having a wonderful Thanksgiving! 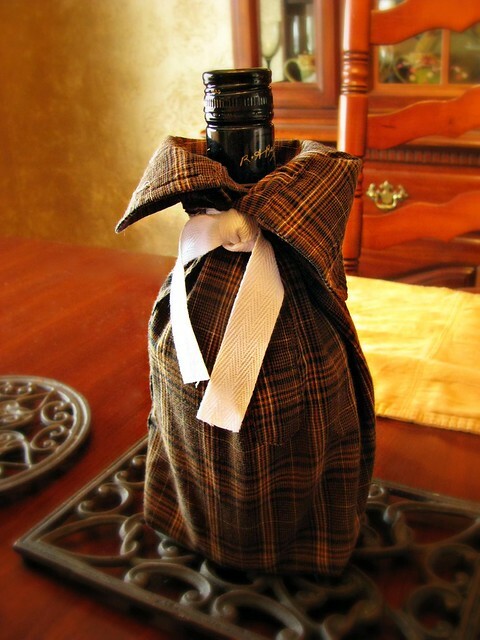 We’re getting ready to visit my cousin, and I’m bringing her a little bottle of something all wrapped up in a “sleeve” bottle wrap. I just sliced the sleeve off an old, unused shirt and stitched the bottom closed. The cuff can button around the bottle, but I kind of liked it turned down. And oh yes, that’s a bottle of Bailey’s Irish Cream. Perfect for sipping while you decorate a Christmas tree or sit with your sweetie in front of a toasty fire. Bring on the holidays! What a cute idea! I love Irish Cream, so that was a good choice. Have fun visiting your cousin.